“Twenty years ago, air quality experts with the national parks service and forest service sounded the alarm that our region had some very significant air quality issues,” said Bill Eaker during the Clean Cities Partnership Celebration on July 30 at the Blue Ridge Parkway Visitor Center in Asheville. National and local leaders in the field of alternative fuels and sustainability used this event to pledge their commitments to clean transportation. Guests were encouraged to mingle and check out the new clean energy vehicles recently donated to the Parkway made possible with the help of the Land of Sky Clean Vehicles Coalition coordinated by Eaker. The Parkway received four Ford C-Max Hybrids and three Ford Super Duty Hybrids. Jesse Marcus, the leader of Propane Education & Research Council, recognized that propane-fueled equipment plays an important role in the landscape industry and encouraged the adoption of propane as a clean, domestic and affordable source. Two Generac generators and three Ventrac mowers were also donated. There are plans to get one more truck to supply each of the Parkway’s four districts with a green vehicle, replacing the less-efficient models dating back to 1989. Brandon Hensley, an employee of the National Parks Service explained that a field truck can travel anywhere between 40 to 50 miles per day. 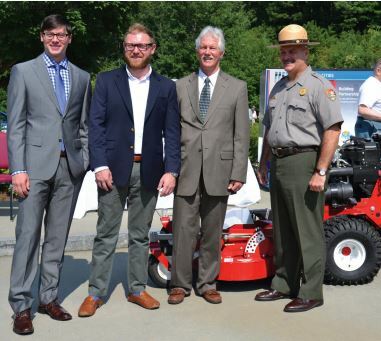 "These new vehicles aid in our efforts to reduce emissions and lower the carbon footprint of the park and to show park visitors how, together, we can make a difference," said Mark Woods, Superintendent of the Parkway. "Cleaner more-efficient vehicles are a perfect complement to the National Park Service’s mission," said Andrew Hudgins, Project Leader of Clean Cities, a program of the U.S. Department of Energy. "This initiative allows a larger audience to learn more about the energy and environmental benefits of these vehicles," said Hudgins. In 2002, North Carolina legislators passed the Clean Smokestacks Act, which helped to improve air quality significantly in the Asheville area, but during the celebration, Eaker emphasized that mobile sources of air pollution also needed to be tackled. This is especially important since the Parkway is a major destination for many travelers. The Blue Ridge Mountains puts on one of the most extended and vibrant leaf color displays due to its range in elevation change. Leaves begin changing on the highest peaks with the early frost during October and then at lower elevations with the warmer weather prolonging the color. Visitors travel along segments of the Parkway’s 469-mile distance to catch a glimpse of this during leaf season. "The people who come to visit need to know their impact," said Stan Cross, co-founder and Principal of Brightfield Transportation Solutions. Cross urged that this partnership is a great opportunity to inform locals and visitors on the role they have to play in reducing emissions. "We know we are still a long way from solving the region’s energy and air quality problems, but we have the opportunity to influence millions of park visitors as we lead by example," said Woods.